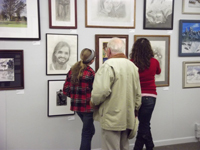 _Alma Community Art Center offers exhibition opportunities in the Wassenaar Art Gallery for juried group exhibitions for all artists, invited professional artists, and open exhibitions showcasing the work of area artists. All work may be sold with a 30% commission to Alma Community Art Center - proceeds are used to fund our programming and gallery. We hope that the gallery space is a place to honor artists in all areas of their potential by offering various open exhibition opportunities as well as to expose the community to art for inspiration and education. We will announce a “Call to Artists,” whereby artists may enter a fixed number of pieces created within a certian time frame. Exhibitions whereby the exhibition committee invites an artist or group of artists to exhibit their work at the Wassenaar Gallery. You may submit the name of professional artists you would like the committee to consider at any time. Provides an opportunity for anyone in the community to enter work for a “salon style” exhibition. This is not a juried exhibition and is open to artists at any level of artistic development.